I’m the Shiksa in the family. Never heard of potato pancakes, let alone latkes before I met my husband. My mother-in-law, Ruth, would make them for our Passover Seder table and for Rosh Hashanah. She made her latkes as we sat at the table, missing much of the early conversation, which I know was a great frustration for her. However, her latkes were VERY much in demand and our accolades I think made it worth her while toiling over the hot stove and oil. The latkes came out in small batches and were offered first to my father-in-law, Sam, at head of the table, then my husband and I who sat next to him on the right and then his sister across from us. Others had to wait until the next platter came out and so it went. So much work on such special occasions. Ruth passed away very young (64) and the traditions passed on to my sister-in-law (Passover) and me (Rosh Hashanah). Unfortunately, her recipes passed with her. It took many years before I finally got the thumbs up from Sam on various holiday recipes and it all came from one source. In 1990, the New York Times did a review of a cookbook, SPIRIT and SPICE: The Complete Jewish Cookbook (Lubavitch Women’s Cookbook Publications, Brooklyn NY), which I bought. The challah, stuffed cabbage, latkes, and honey cake, were all winners; the book has many, many pages with hand-written four stars and “Sam loves this!” It was such a pleasure to finally satisfy his food memories. Latkes are pretty basic, potatoes, onion, flour, eggs, salt and pepper. But I wanted to give the book a shout out as it helped me bring back a favorite to our traditional Jewish table. Unlike Ruth, I don’t want to be stuck in the kitchen cooking while everyone is at the table. I also don’t want the house to smell like oil on the holiday and have to clean up the mess after everyone leaves. I make my latkes a week or two in advance, freeze and reheat. It makes entertaining over the holiday so easy. This year we’re doing a “latke bar” for Christmas Eve dinner (remember, Shiska here; we celebrate it all). I’m making bite-size latkes with sides of applesauce, sour cream, diced red onion, and small pieces of lox; everyone builds their own. The keys to success in making latkes are setting up properly before you start cooking, shredding the potato to the right size (too long and the ends burn, too short and they’re pasty), draining the potatoes, using a high smoke-point oil, such as peanut or canola, heating the oil to the right temperature (350ºF) and keeping it clean (removing stray potato pieces from the oil before starting another batch). Temperature control is essential for properly cooked fried foods of any kind. Cook in batches, overcrowding the pot decreases the temperature dramatically, and the temperature drops quickly when the food is placed in the pan and needs to be adjusted throughout the cooking process. If the oil is too hot, the outside browns quickly and the inside is undercooked. If the oil is not hot enough, the outside doesn’t brown properly, the inside is raw and the starch absorbs more oil resulting in greasy, flabby fried food. My go-to tool for frying is an electric frypan. It has a temperature gauge, which allows you to set a specific temperature and maintains it evenly throughout the cooking process. No worrying about turning the flame up and down. Clean up as you cook. While waiting to flip the latkes, take advantage of the minute or two to load the dishwasher or wash and dry a tool or two. By the time you finish the batches, most of the clean up is done. 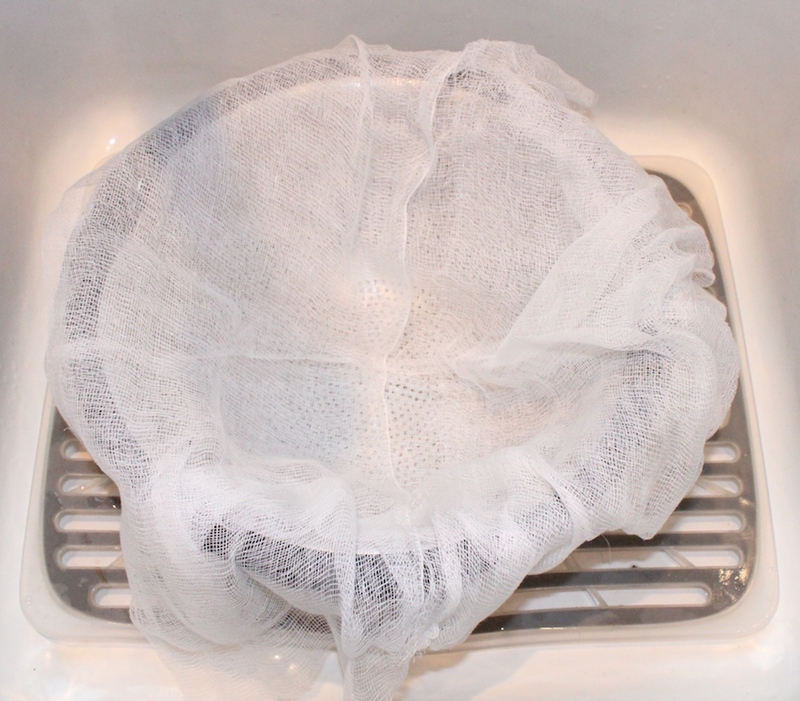 Line the colander with two opened layers of cheesecloth long enough for the ends to drape over the side by about four inches. ; one going north and south, the other east and west. 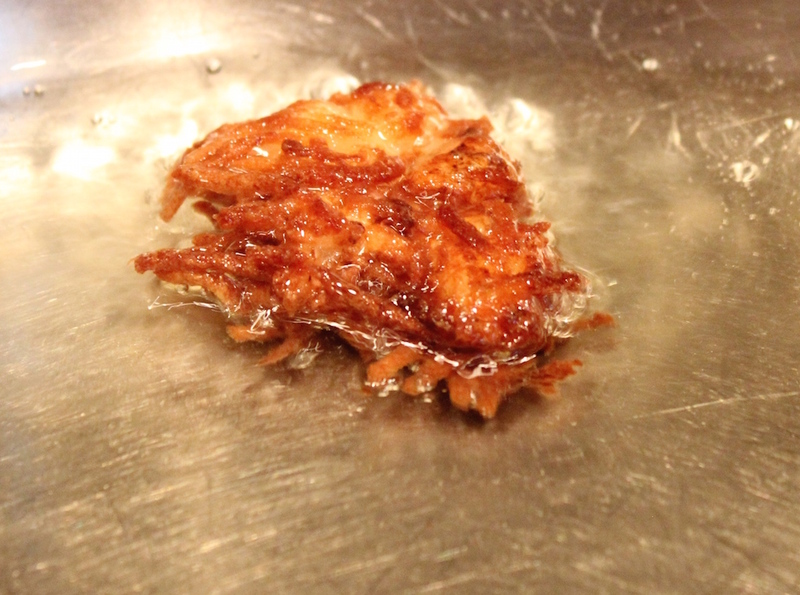 Fill the frypan with a thin layer of oil. My pan is 11-inches wide and about 1 1/2-inches deep. I used 1 1/2 cups peanut oil to start. Later I added another 1/2 cup. At the end I had about one-half cup oil left. Place the trays next to each other on one side of the frypan for easy access, with the mesh strainer on the paper towel-lined tray. Place the bowl with the latke mixture on the other side of the frypan. I didn’t have a large onion in the pantry and used three small to medium sized onions. 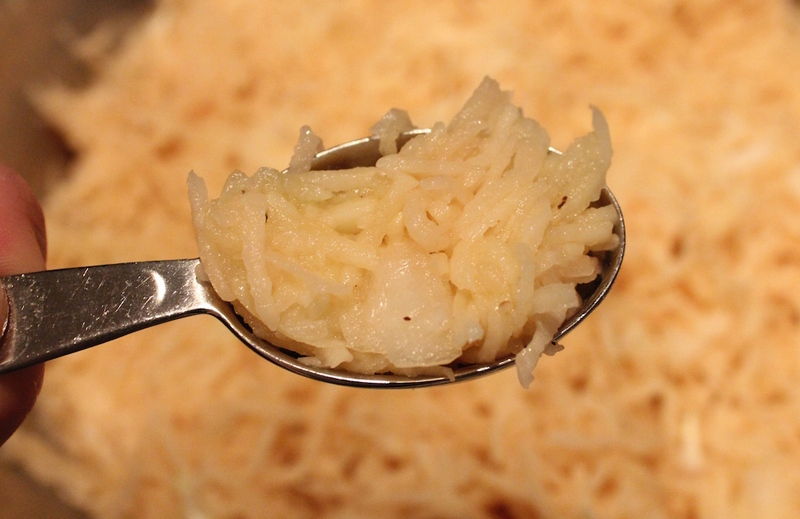 Cut the onion and one potato into chunks and put in a food processor and chop up small. Dump this into the lined strainer. 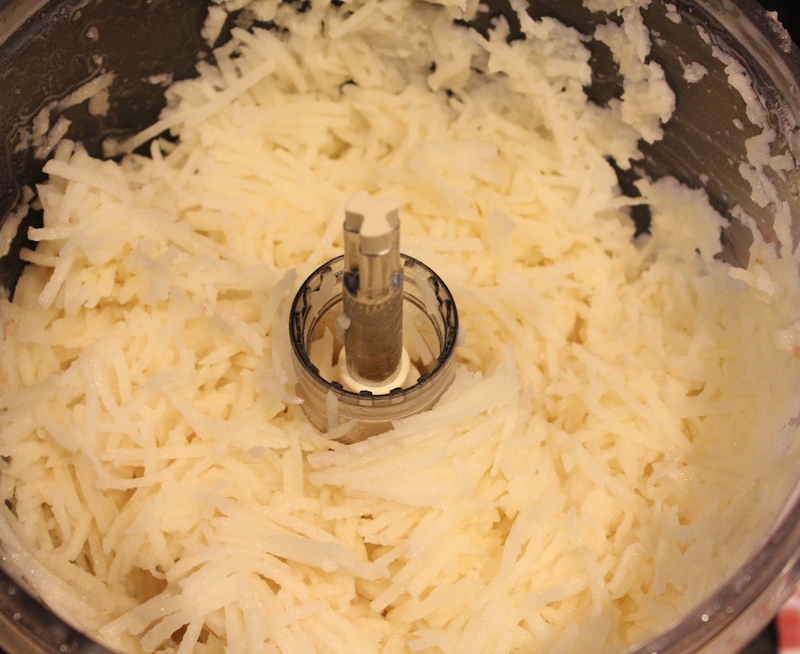 Quarter the remaining potatoes lengthwise and shred in the food processor or with a grater. Place the shredded vegetables in the colander. 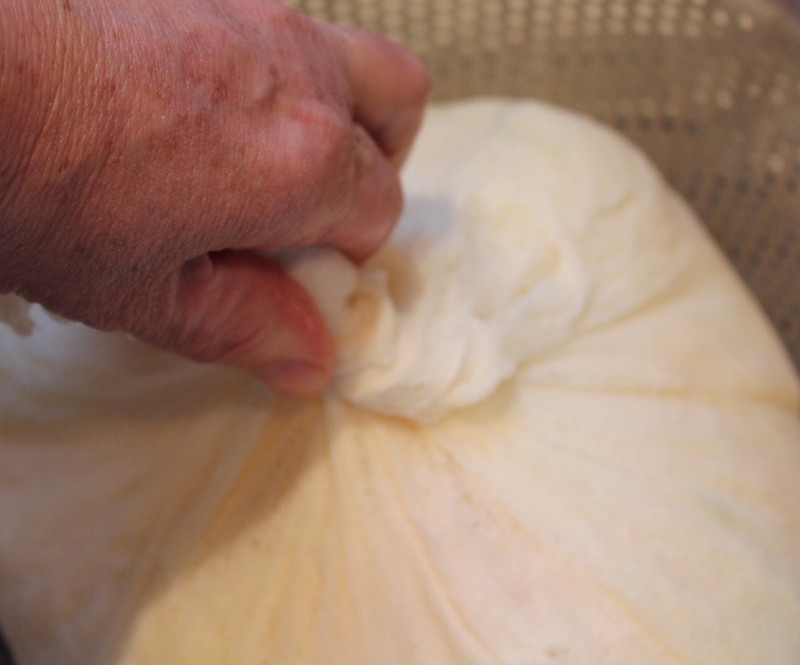 Pull the sides of the cheesecloth up and together. Twist tightly until the vegetables begin to weep. Keep squeezing until no more water leaks out. Then wrap the ball in a towel to remove the outside water. 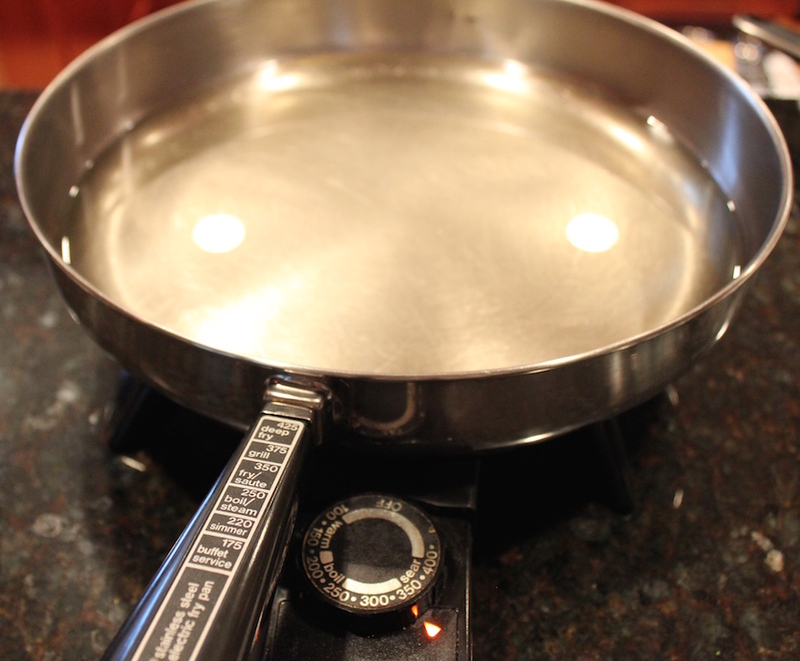 In the meantime, heat the oil in the electric frypan set to 350ºF or in a large frypan over medium-high heat to 350ºF. 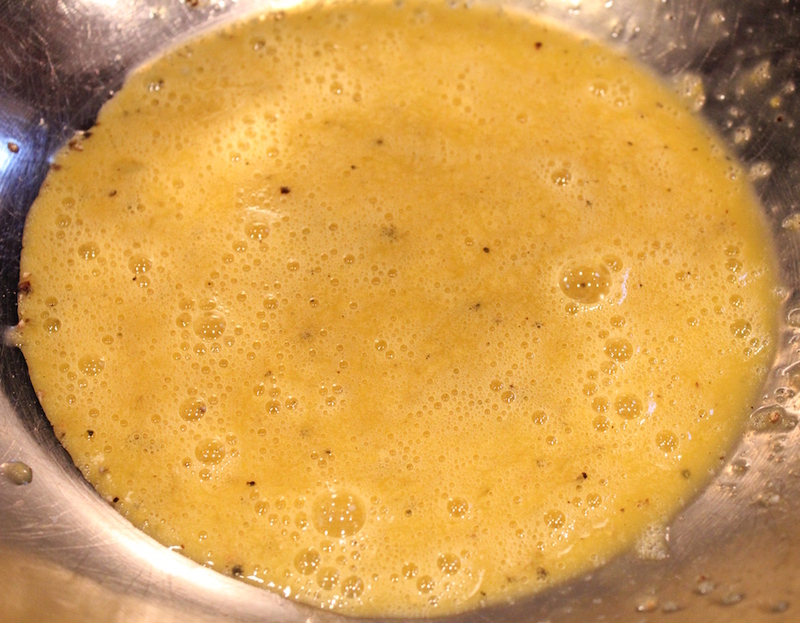 Whisk the eggs, salt and pepper in a large mixing bowl. Add the drained shredded vegetables and mix well. 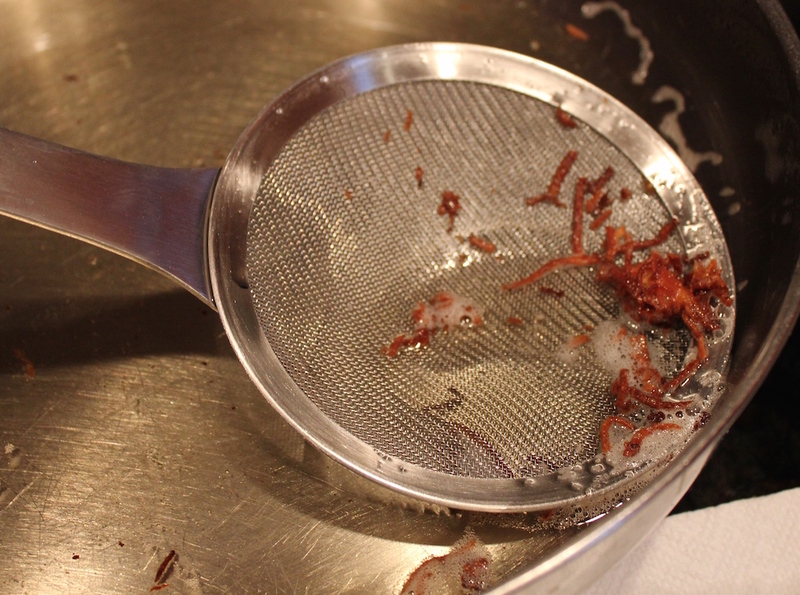 Use your measuring tool to scoop up the latke mixture and gently drop into the hot oil, flatten larger latkes with the back of the tool and repeat until the pan is fairly full. 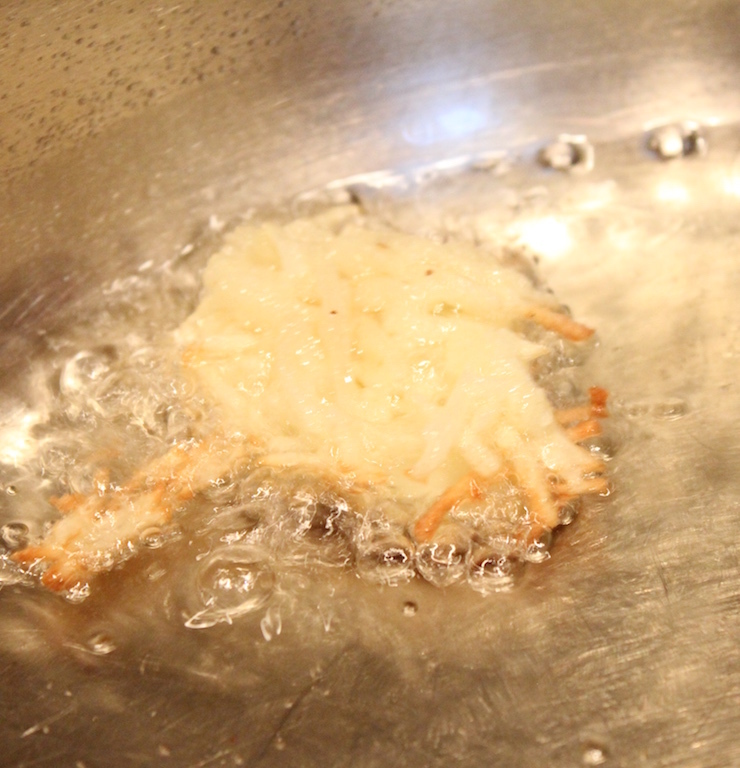 There should be spaces between each latke to fry them properly. I usually fry a single latke first to taste and make sure it’s properly seasoned before doing large batches. 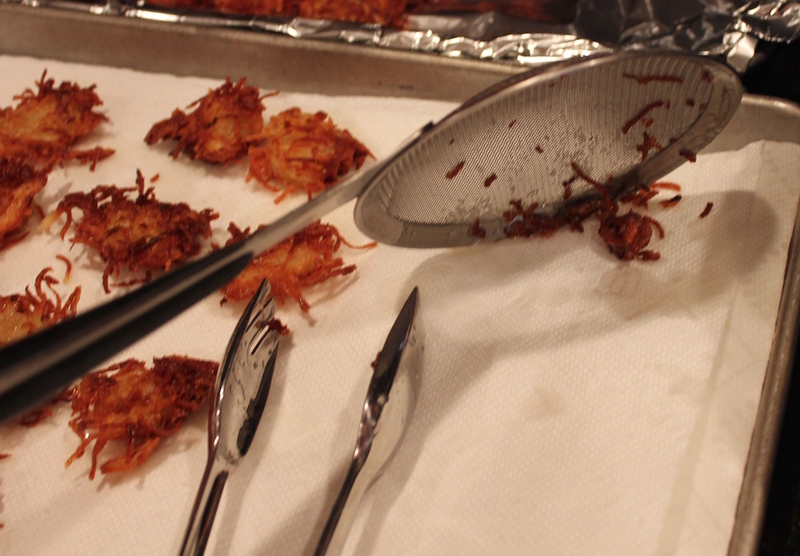 Flip with tongs for mini latkes. Cook until brown, just a minute or two for these minis, flip and cook another minute or two. Set on the paper towel lined tray to drain and sprinkle immediately with a little salt. Clean the oil with the mesh-lined ladle to remove any stray pieces of potato to prevent them from burning, which breaks down the oil and gives it a bad flavor. These little tidbits are a great little treat for the cook! 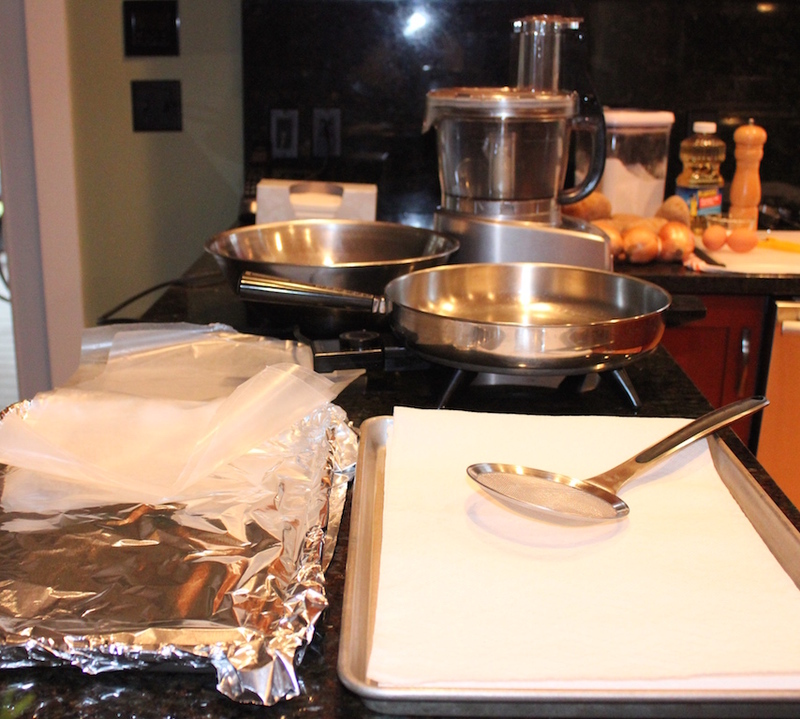 Transfer the latkes to the foil lined tray after you flip the next batch. 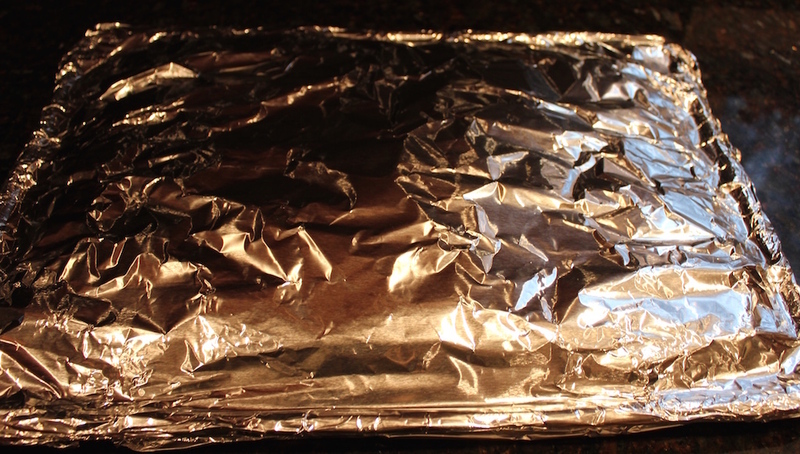 Once the tray is full, place a sheet of wax paper or parchment on top to start another layer. Repeat this procedure until the latke mixture is gone. As you get to the bottom, there’s more liquid; press the vegetables into the measuring tool to drain before dropping into the cooking oil. The excess liquid causes much spattering. Lay another sheet of wax paper over the top. Tightly wrap the tray of fried latkes in foil. 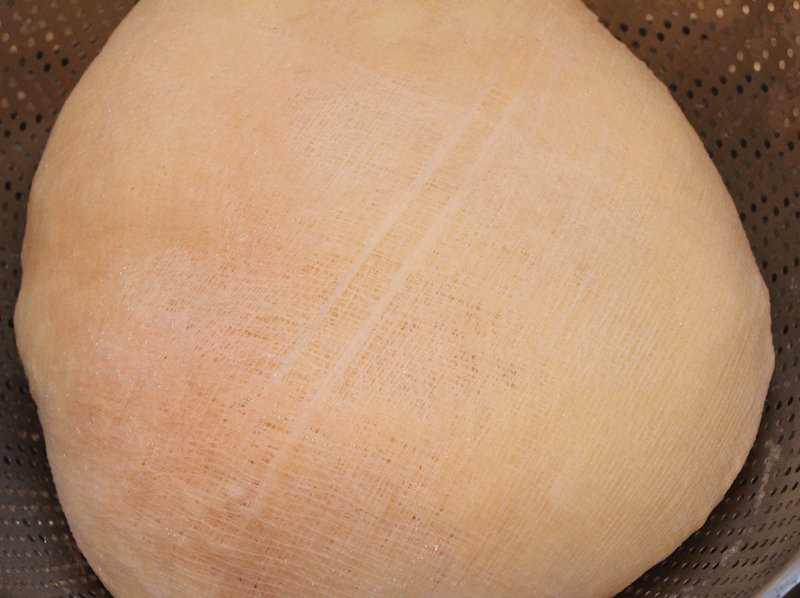 If using within three or four days, refrigerate, otherwise freeze. Preheat the oven to 400ºF and cook in single layer batches until hot and crispy, about 12 minutes. 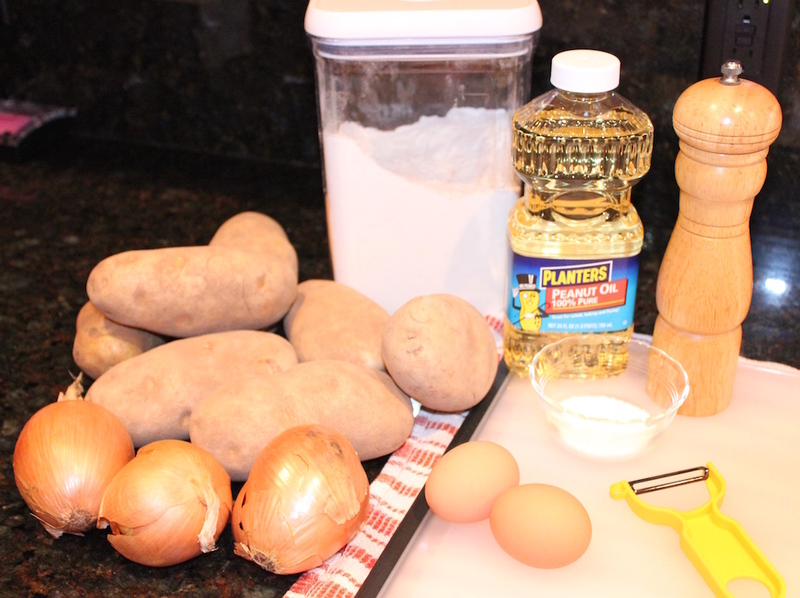 The keys to success in making latkes are setting up properly before you start cooking, shredding the potato to the right size (too long and the ends burn, too short and they’re pasty), draining the potatoes, using a high smoke-point oil, such as peanut or canola, heating the oil to the right temperature (350ºF) and keeping it clean (removing stray potato pieces from the oil before starting another batch). Temperature control is essential for properly cooked fried foods of any kind. Cook in batches, overcrowding the pot decreases the temperature dramatically, and the temperature drops quickly when the food is placed in the pan and needs to be adjusted throughout the cooking process. If the oil is too hot, the outside browns quickly and the inside is undercooked. If the oil is not hot enough, the outside doesn’t brown properly, the inside is raw and the starch absorbs more oil resulting in greasy, flabby fried food. My go-to tool for frying is an electric frypan. It has a temperature gauge, which allows you to set a specific temperature that it maintains pretty evenly throughout the cooking process. No worrying about turning the flame up and down. I use it for panfrying, such as the latkes or chicken cutlets and deep frying, such as French fries and fried chicken. Clean up as you cook. While waiting to flip the latkes, take advantage of the minute or two to load the dishwasher or wash and dry a tool or two. By the time you finish the batches, most of the clean up is done. Cut the onion and one potato into chunks and put in a food processor and chop up small. Dump this into the lined strainer. 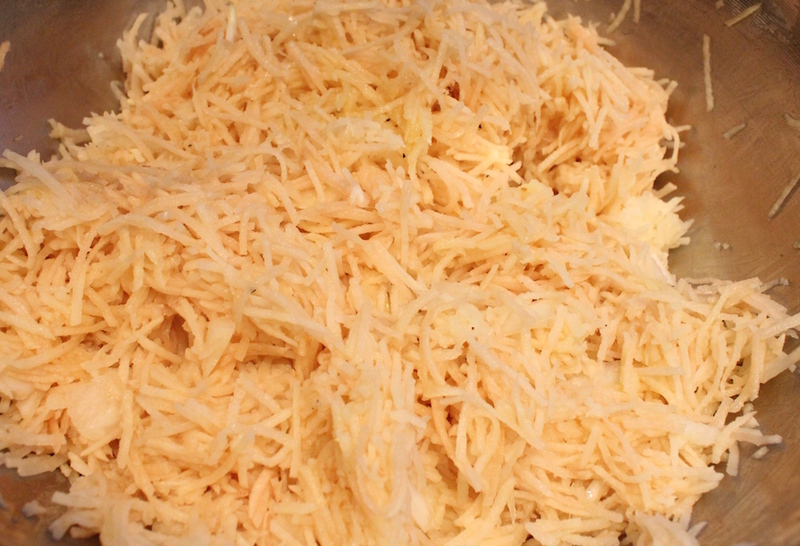 Quarter the remaining potatoes lengthwise and shred in the food processor or with with a grater. 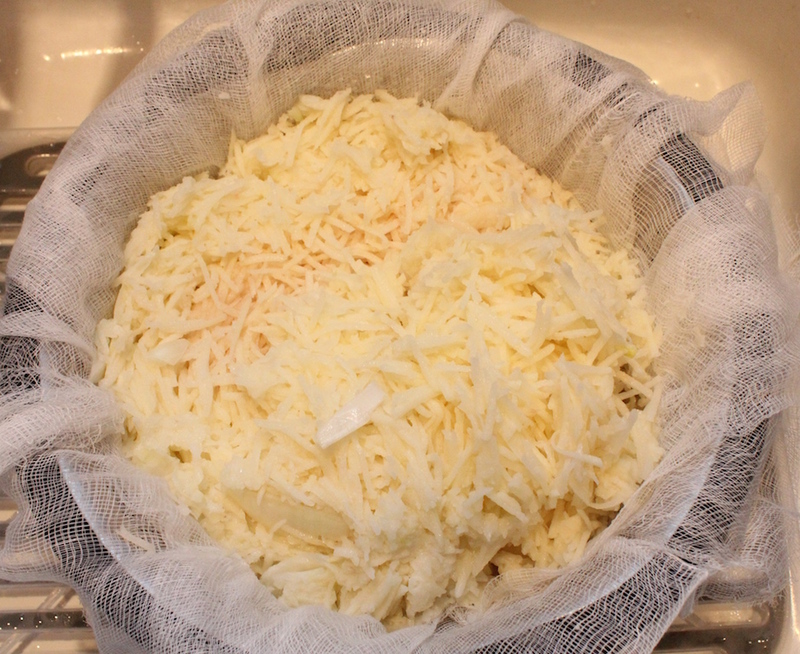 Place the shredded vegetables in the colander and pull the sides of the cheesecloth up and together; twist until the vegetables begin to weep. Keep squeezing until no more water leaks out. Then wrap the ball in a towel to remove the outside water. Beat the eggs, salt and pepper in a large mixing bowl. Add the drained potatoes and onion and mix well. Sprinkle the flour over the vegetables and toss; It’s important to wait until this point to add the flour. 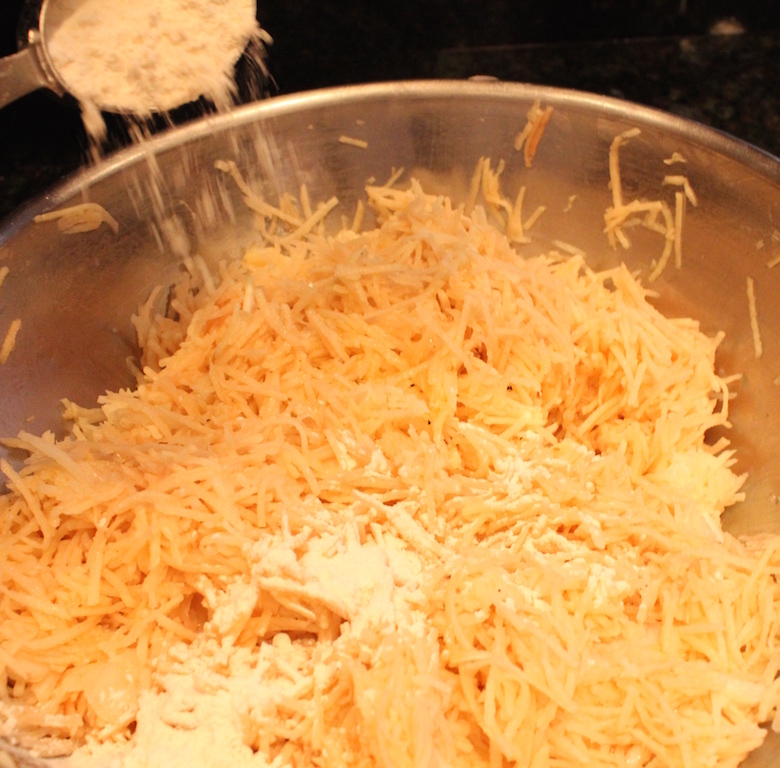 Adding directly to the beaten eggs causes the flour to clump. Cook until brown, just a minute or two for these minis, flip and cook another minute or two. Larger latkes will take three or four minutes. The latkes should be golden brown and crisp on the outside. Set on the paper towel lined tray to drain. Clean the oil as needed with the mesh ladle to remove any stray pieces of potato to prevent them from burning, which breaks down the oil and gives it a bad flavor. These are great little treats for the cook! 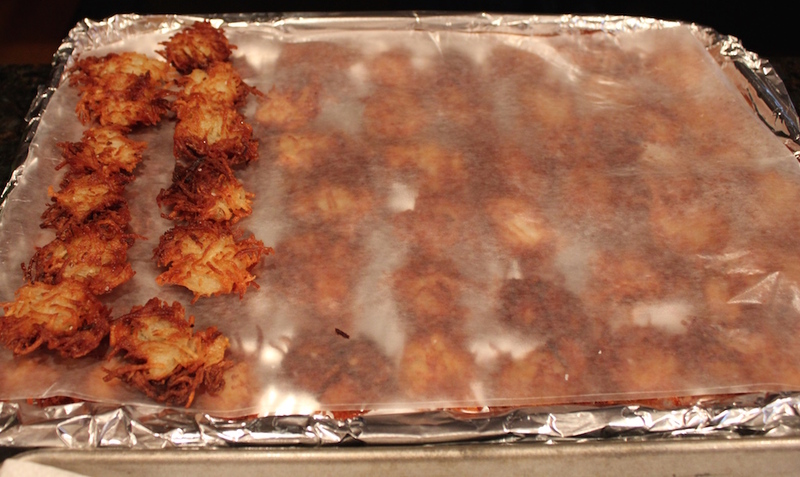 Transfer the cooling latkes to the foil lined tray after you flip the next batch. Once the tray is full, place a sheet of wax paper on top to start another layer. Repeat this procedure until the latke mixture is gone. As you get to the bottom, there’s more liquid; press the vegetables into the measuring tool to drain before dropping into the cooking oil. The excess liquid causes spattering. 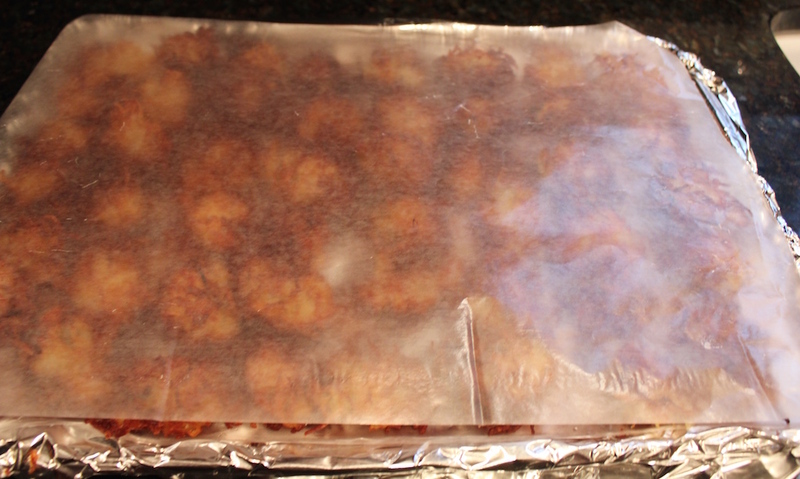 Place another sheet of wax paper on top and tightly wrap the tray of fried latkes in foil. 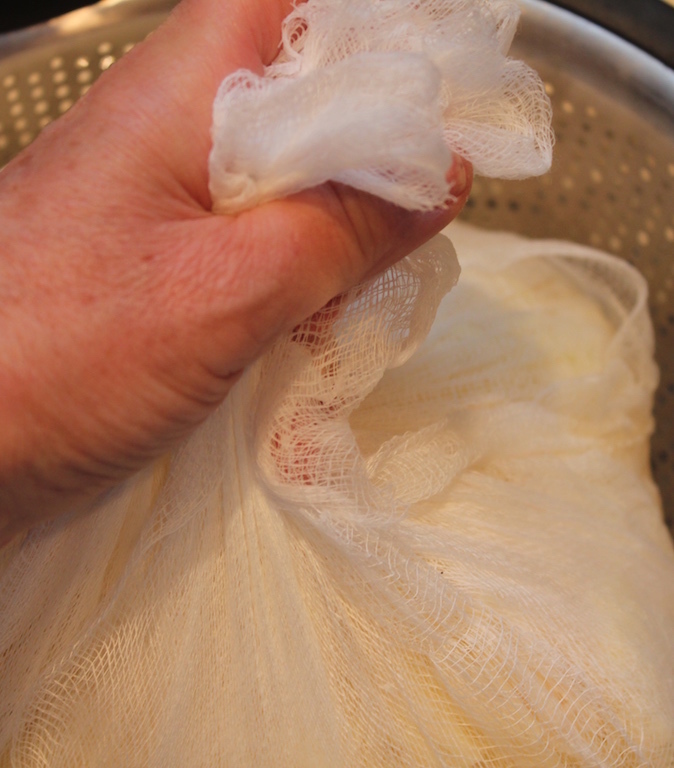 If using within three or four days, refrigerate, otherwise freeze. Preheat the oven to 350ºF and cook in single layer batches until hot and crispy, about 8 -12 minutes, depending on the size of your latkes.